BOSTON//June 12, 2018//Today, Boston Common Asset Management was recognized for creating extraordinary positive impact as a business based on an independent, comprehensive assessment administered by the nonprofit B Lab. 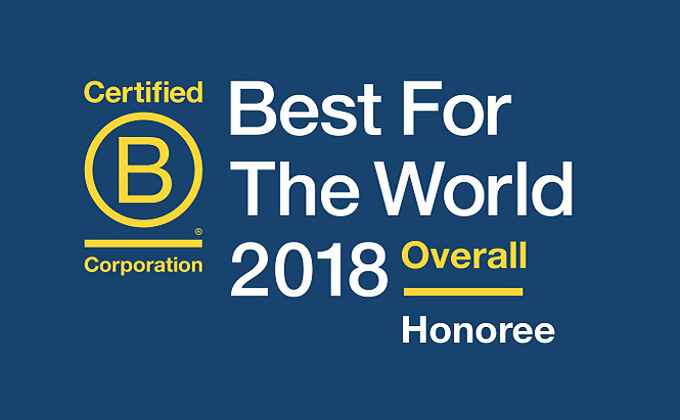 Boston Common is honored in the Best For The World Overall list, which includes businesses that earned scores in the top 10 percent of more than 2,400 Certified B Corporations across all categories on the B Impact Assessment. The assessment measures a company’s positive impact on its workers, community, customers and the environment. To certify as B Corporations, companies like Boston Common must complete the full assessment and have their answers verified by B Lab. The full B Impact Assessment evaluates a company’s environmental performance, employee relationships, diversity, involvement in the local community, the impact a company’s product or service has on those it serves, and more. Honorees scoring in the top 10 percent of all B Corporations set a gold standard for companies using business as a force for good. The 226 Best For The World Overall honoree companies come from 92 different industries and 30 countries. B Lab simultaneously released separate lists recognizing top-performing B Corporations as Best For Environment, Best For Customers, Best For Governance, Best For Community and Best For Workers, which can be found at bthechange.com/bestfortheworld. In the fall, B Lab will release the Best For The World: Changemakers and the Best For The World Funds lists.